Be the first to share your favorite memory, photo or story of Kyrstin. This memorial page is dedicated for family, friends and future generations to celebrate the life of their loved one. 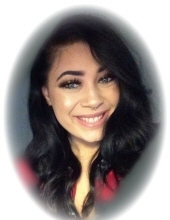 Kyrstin O'Shea Sensabaugh, age 21, of Knoxville passed away ‪on Monday morning‬, November 19, 2018. Kyrstin was a graduate of Karns High School Class of 2015. She loved doing makeup & singing RnB as loud as she could. Her contagious smile lit up every room she walked into. She is preceded in death by her great grandmother, Nellie Hibbert. She is survived by her parents, Robert “Shane” and Stephanie Sensabaugh; sister, Baileigh Sensabaugh; grandparents, Clint (Sue) Schrimpsher, Karen (Tim) Ball, Arlene (Cordell) Sherman, Robert Sensabaugh Sr; uncles, “Kunkle” Clint (Erin) Schrimpsher II, Gary (Jessica) Hall; aunts, LaQuesta Sensabaugh, Brandy (Patrick) Gates; special cousin, Makinli Hibbert; several other uncles, aunts, cousins and grandparents. The family will receive friends on Saturday from 12-2, followed by a Celebration of Life at the Click Funeral Home Middlebrook Chapel with Rev Jason Rogers officiating. Interment will follow in the Hibbert Cemetery. To send flowers or a remembrance gift to the family of Kyrstin O'Shea Sensabaugh, please visit our Tribute Store. "Email Address" would like to share the life celebration of Kyrstin O'Shea Sensabaugh. Click on the "link" to go to share a favorite memory or leave a condolence message for the family.